Did you catch this episode of UTV Bindass Style Police? Well if you didn't, here is our segment where MissMalini attended the book launch of Kalli Puri. In this clip, MissMalini interviews Anurag Kahyap, Rahul Bose, Gul Panag and author Kalli Purie. Daniel Kahneman's "Thinking Fast and Slow" occupies the top spot in the non-fiction section of the bestseller list this week, while Sir Jeffrey Archer's "The Sins of the Father" dominates fiction. New Delhi, March 3 (IANS) Daniel Kahneman's 'Thinking Fast and Slow' occupies the top spot in the non-fiction section of the bestseller list this week, while Ravinder Singh's 'I Too Had a Love Story' dominates fiction. Frankly speaking, this was the last book that I wanted to ever read. Or perhaps I didn't want to even read it...ever. Not yet. Perhaps when I become thinner I might muster the courage to take a sneak peak. It is not at all a good idea to start reading Confessions Of A Serial Dieter after downing a mound of white rice (so what if it's a healthy variety) and freshly cooked spicy broth of gobhi-matteraloo. This realisation hits me quickly, just after I finish with my ill-timed platter of indulgence and start devouring the book. This is a blessing for most people who are a victim of scrutiny -by self and society. In this memoir, Kalli Purie shares her account of her journey of weight loss. Since it is the author's true life experiences and tale, it lends the book a lot of authenticity and credibility. I must confess that I was aghast when Brajesh came home with this book from his last trip. A "How-To / Self-Help" book??? and one on DIETS to top it off??? ! thought I had married a man with more sense than that! We don't read How-to books and while we both need to do something concrete about our weight, we both know that diet books are not the solution that they advertise to be. This books tells how she went from 103 kgs to 59 kgs in three years flat.If you are looking for a book that will help you decide which is the best Diet /best Workout for weight-loss then this is not it. Three launches - two books and a calendar - all in one week. 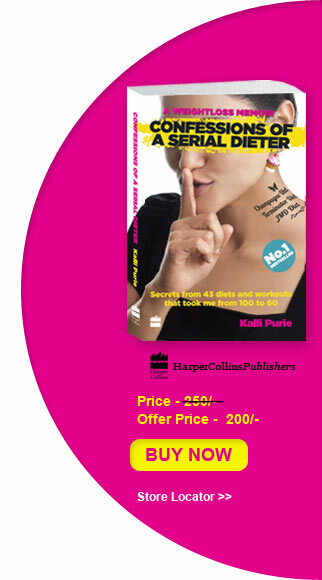 Somewhat on the lines of the Shopaholic and Bridget Jones books is the homegrown Confessions Of A Serial Dieter by Kalli Purie, daughter of India Todayboss Aroon Purie. I've always been on the chubby side. When I was a kid most people found it endearing and in my pre-teens everyone assured me that it was baby fat and would melt away as I grew older. As I picked up Confessions of a Serial Dieter, I loved the first look of the cupcake earring and the mystery surrounding the serial dieter on the cover. And from the first page, I was hooked as the secrets unraveled with each chapter. So I went to this awesome (and very unique) book launch the other day where everyone from Dimple & Twinkle Khanna, Rahul Bose, Parmeshwar Godrej, Rashmi Uday Singh, Anuragh Kashyup, Poonam Dhillon, Nisha JamVwal, Jatin Kampani, Kalki Koechlin, Soni Razdan and Gul Panag were either participating or in attendance. 'Confessions of a serial dieter', by Kalli Purie, daughter of the owner and editor of India Today group comes to me by her to read through and to comment upon it on twitter. The book is interestingly written and presented and the last page where she shows her own progression on weight loss is quite a revelation. When self help books have a bit of personality, i am always interested. And the brand new - Confessions of a Serial Dieter sounds like just the kind of book i might read (Though honestly, dieting is not my cup of tea (or should i say, not my bar of chocolate). Dimple Kapadia and Twinkle Khanna were present at the book launch of 'Confessions Of A Serial Dieter'. Kalki Koechlin and Anurag Kashyap were the others who were spotted at the event. (From left) Adi Godrej, Ashok Hinduja, Prakash Hinduja, Parmeshwar Godrej, Aroon Purie, Soni Razdan and Kalki Koechlin at the launch of Kalli Purie's book Confessions of a Serial Dieter in Mumbai on Saturday, January 7, 2012.